I haven't made a breakfast recipe in a while! In the past I've shared my Pumpkin Chocolate Chip Pancakes that are moist and fluffy, and were a great holiday recipe. I've also made my Energizing Chocolate Granola that's perfect by itself for a breakfast to-go or in yogurt and smoothie bowls. If you're someone who likes to start the day with a healthy kick, I've got my Protein Packed Chocolate Oatmeal with 27g of protein a serving. All the recipes above, though, are sweet, and sometimes it's nice to have something a little savory for breakfast. 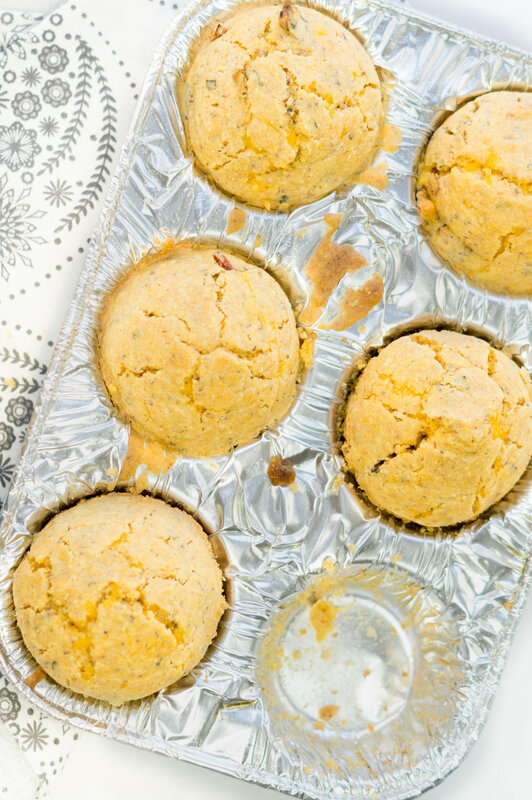 The sun-dried tomatoes are just the right amount of sweet while the cornbread and cheddar balance out the other side with a hint saltiness. These are super fast to whip up and all together probably took no more than 25 minutes, including baking time. They even freeze well! I'll be making these again this weekend for my parents when I go home to visit, they've already insisted on it (haha). I already know these will become a lazy weekend breakfast staple for my family. Prepare your flax egg, mixing the water and flax meal, and place in the fridge allowing to chill. Preheat your oven to 400 degrees. Grease a muffin tin. In a medium sized bowl, combine the cornbread mix, vegetable oil, dried basil, sun-dried tomatoes, and cheddar cheese, mixing until thoroughly combined. Add the flax egg in last, again mixing in thoroughly. Pour the mixture into your greased muffin tin, filling each well until it's almost level with the surface of the tin. Leave about 1/2 cm of room. These muffins will rise but you don't want them completely spilling over. Place in the oven for 15 minutes. After 15 minutes, remove the muffins from the oven and allow to cool for 5-7 minutes before removing from the tin or eating. Serve with a little vegan butter if eating immediately. These freeze well and will keep in your fridge for up to a week after baking. I recommend storing them in a sealable container or ziplock bag.